Hey, so I designed a redstone circuit pictured above that might be of use to some people. I haven't seen this anywhere else before. From what I can tell, it has a good number of potential uses. Basically, the bottom line of what it does is that it turns a button into a lever, but has more benefits which I explain further below. 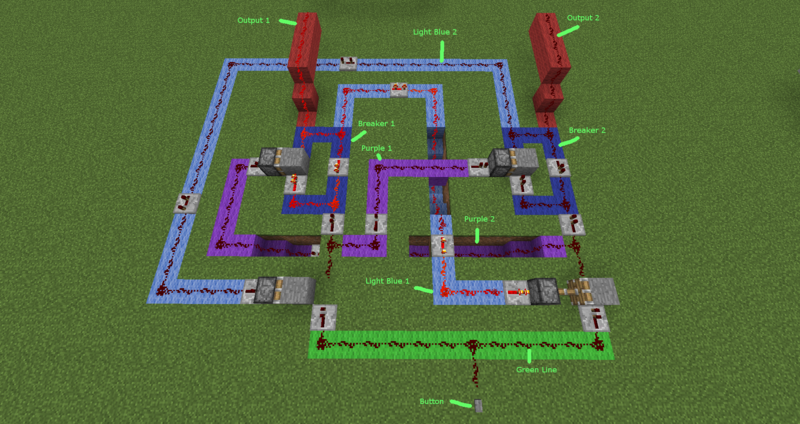 So at the start, power is given to the first red output of the circuit. When the button is pressed below the green line, it will disconnect power given to the first red output and power will be diverted to the second red output. By pressing the button again, power will be disconnected from the second output and will be given back to the first output. This is achieved with the breakers (I had no idea what to call them). The breakers infinitely send power in a circle and keep the outputs powered. Power is also diverted to a piston in the light blue 1 line that connects the second circuit so that the next time the button is pressed, it will bring the power to the second circuit. When power is given to breaker 1, the purple 1 line is activated and power is given to the piston which disconnects breaker 2. Because the purple 1 line is not connected to breaker 1, power is lost when the button disconnects and won't stay powered, allowing breaker 2 to repeat it's process when power is given again when the button is pressed another time. 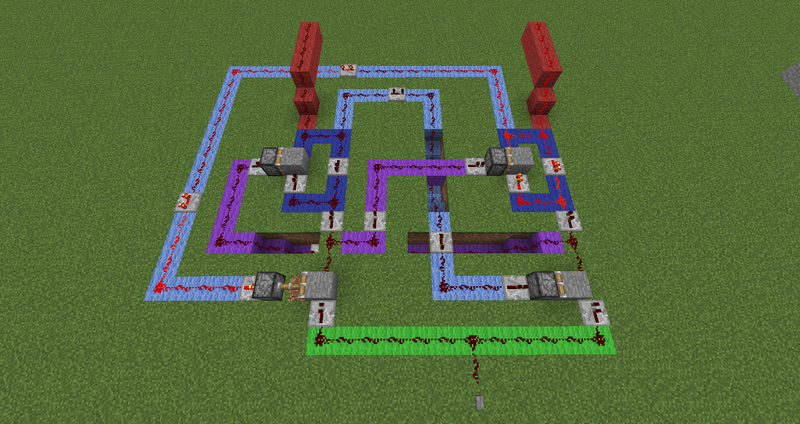 What you see above is the base circuit, it can be tweaked and edited to do many things. One of the more useful things I think it can do is make hidden piston doors activated by buttons stay open, but also have an infinite number of buttons that can be pressed to open and close the doors. For this, you'd only require one of the outputs to power the door on and off. As long as each button added to the circuit is connected to the green line, it will power the circuit and any button can be pressed in any sequence and it won't jam the circuit. This is my compact version i made for a guy on reddit a while back. The type of circuit you are describing is a T-Flip-Flop. They come in lots of various compact sizes. MrLittleKitty wrote: The type of circuit you are describing is a T-Flip-Flop. Thanks for clarifying. I have found much smaller ones now that I know it's an already-made circuit with a name.